You’ll achieve the best results by combining logic and intuition – left and right brain. That means you set up your healing sessions with an expectation, system, and technique. Your confidence will grow as you apply this model if you want to heal yourself or others. Forensic Healing is about finding ‘clues’ in the body that relate to unwanted conditions and applying specific healing pathways to release it from the body. It’s time for you to become the detective and use proven biofeedback methods that zero-in on information that confirms your client’s or your own condition. Everything reveals itself in patterns and everything you create is already in your energy field. Combining the Forensic Healing framework with your own energy field gives the power to change outcomes, conditions, and lives. The Essentials course also gives you the building blocks to begin your own personal healing journey or to become a diploma-qualified Forensic Healer. This can be achieved by upgrading to the Online home study course or attending one of our Live training programs. Marisa hopes to meet you over the coming year as we travel through the United Kingdom, Ireland, North America, Australia and a country near you. 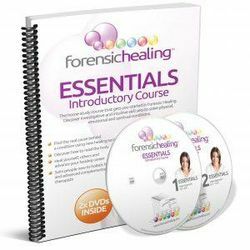 GET THE FORENSIC HEALING ESSENTIALS ONLINE COURSE NOW FOR AUD$47! The 1-day Essentials workshop develops your investigative and intuitive skill sets using the Forensic Healing system. Great for those wanting to sample the Diploma Course and learn and experience energy healing techniques. No Pre-requisites needed.